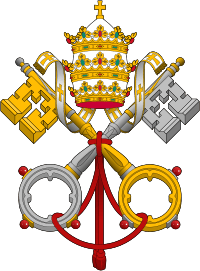 The Second Council of the Lateran is believed to have been the Tenth Ecumenical Council by Roman Catholics. 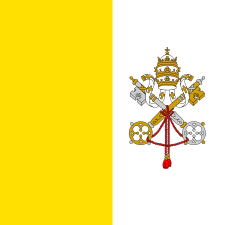 It was held by Pope Innocent II in April 1139, and was attended by close to a thousand clerics. Its immediate task was to neutralise the after-effects of the schism which had arisen after the death of Pope Honorius II in 1130 and the papal election in the same year that set up Petris Leonis as the antipope Anacletus II. After the death of Honorius II, Petrus Leonis, under the name of Anacletus II, was elected as Pope by a majority of the cardinals and with the support of the people of Rome on the same day as a minority elected Innocent II. In 1135, Innocent II held a council at Pisa, which confirmed his authority and condemned Anacletus. Anacletus's death in 1138 helped largely to solve the tension between rival factions. Nevertheless, Innocent decided to call the tenth ecumenical council. The Council assembled at the Lateran Palace and nearly a thousand prelates attended. In his opening statement Innocent deposed those who had been ordained and instituted by Anacletus or any of his adherents. King Roger II of Sicily was excommunicated for maintaining what was thought to be a schismatic attitude. The council also condemned the teachings of the Petrobrusians and the Henricians, the followers of Peter of Bruys and Henry of Lausanne. Finally, the council drew up measures for the amendment of ecclesiastical morals and discipline which the council fathers considered had grown lax. Many of the canons relating to these matters were mostly a restating of the decrees of the Council of Reims and the Council of Clermont. Canon 4: Injunction to bishops and ecclesiastics not to cause scandal by wearing ostentatious clothes but to dress modestly. Canons 6, 7, 11: Repeated the First Lateran Council's condemnation of marriage and concubinage among priests, deacons, subdeacons, monks, and nuns. Canon 12: Fixed the periods and the duration of the Truce of God. Canon 14: Prohibition, under pain of deprivation of Christian burial, of jousts and tournaments which endangered life. Canon 20: Kings and princes were ordered to dispense justice in consultation with the bishops. Canon 25: Forbade any cleric to accept a benefice from a layman. Canon 27: Nuns were prohibited from singing the Divine Office in the same choir with monks. Canon 28: No church was to be left vacant more than three years from the death of the bishop; secular canons who excluded regular canons or monks from episcopal elections were condemned. Canon 29: The use of bows and crossbows against Christians was prohibited. Another decision confirmed the right of religious houses of a diocese to participate in the election of the diocese's bishop. 1 2 3 Herbermann, Charles, ed. (1913). 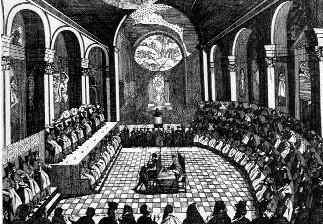 "Second Lateran Council (1139)". Catholic Encyclopedia. New York: Robert Appleton Company. ↑ The sources are collected in Hefele, Histoire des conciles d'apres les documents originaux, trans. and continued by H. Leclerq 1907-52., 5/1, 721-722; but see also, Bernhardi Jahrbuecher der deutschen Geschichte, I Leipzig 1883, 154-160. 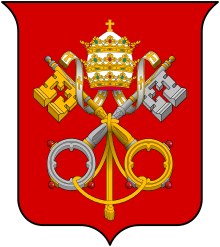 ↑ "Tenth Ecumenical Council: Lateran II 1139". Internet Medieval Source Book. 1 November 1996. Retrieved 5 May 2007. ↑ Burton, Janet (1994). Monastic and Religious Orders in Britain: 1000-1300. Cambridge Medieval Textbooks. Cambridge UK: Cambridge University Press. p. 77. ISBN 0-521-37797-8.